Casa Milena is located in Massa E Cozzile, Italy and only 35 km (22 mi) from Lucca in the tourist area "Lucca And Surroundings". 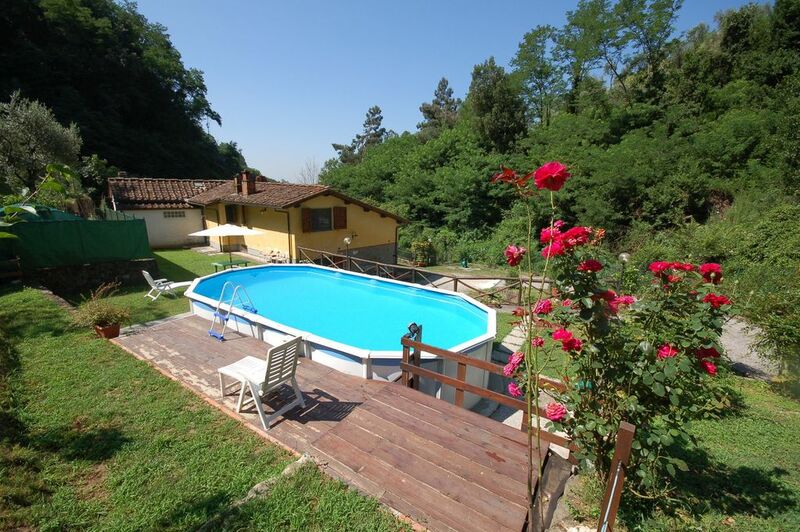 Property Casa Milena is a lovely property (120 sq m) that includes private pool and internet. The property can sleep up to six people comfortably in two bedrooms with two bathrooms. In nearby towns there are local shops where you can find fresh produce and other items, but if you need a larger shopping center there is one located only 5 km (3 mi) from the property where you can purchase food and essentials. After arriving you’ll find a lovely clean well-maintained property perfect for a peaceful holiday in Tuscany. Regardless of how you spend your days - sightseeing, visiting museums, shopping or just driving in the countryside, when you arrive home you can relax with your family and friends at the pool for a perfect ending to another day in Tuscany. It's very convenient to have a washing machine on-site that is available for your laundry needs. Also available outside are a patio and barbecue grill. Dining with friends and family is a big part of the Tuscan culture. Take advantage of the kitchen to prepare meals using local produce while on your holiday. The kitchen includes coffee machine, microwave, stove and refrigerator, as well as, plenty of tableware and cutlery for up to six people. Most people enjoy visiting close-by cities and towns while on vacation, so for your reference this is a list of popular places with driving distances from the property: Lucca 35 km (22 mi), Florence 52 km (32 mi), Viareggio 56 km (35 mi), Forte Dei Marmi 63 km (39 mi) and Pisa 65 km (40 mi). The highway is only 5 km (3 mi) from the villa and there is a train station 4 km (2 mi) away. Some other major tourist destinations you should consider visiting are: Florence 52 km (32 mi), Viareggio 56 km (35 mi), Forte Dei Marmi 63 km (39 mi), Rome 334 km (207 mi), Venice 287 km (178 mi) and Milan 307 km (190 mi). Pets Welcome - If your pet is travelling with you on holiday that is not a problem at Casa Milena. If you have a large dog or multiple pets, please ask for permission prior to booking. Nearest Airports: Firenze Peretola (Flr) 50 km (31 mi), Pisa (Psa) 63 km (39 mi), Bologna (Blq) 132 km (82 mi), Venezia (Vce) 289 km (179 mi) and Milano (Lin) 303 km (188 mi). The other part of the house, with its own independent entrance, is inhabited only occasionally. Including: kitchen + living room, service room. Kitchen + living room: dining table, dining table, dishwasher, fridge, freezer, microwave, stove top, italian coffee machine, american coffee machine, sofa, fireplace, satellite tv. Service room: iron, washing machine. Including: bedroom + ensuite bathroom, bedroom, bathroom, open space. Bedroom + Ensuite Bathroom: double bed, basin, toilet, bidet, shower. Open space: single bed, sofa bed double. Including: patio, garden, parking space. Patio: al fresco dining, dining table. Garden: swimming pool (width: 3.8m, length: 7.9m, depth: 1.2m), barbecue, al fresco dining, dining table (people: 6), garden furniture. Parking space: inside the property. Wir wurden sehr freundlich vom Besitzer bei der Anreise empfangen. Die Ausstattung reicht völlig aus für einen gemütlichen, erholsamen Urlaub. Wir durften eine sehr saubere Liegenschaft mit einem großen Auslauf für unseren Vierbeiner übernehmen. Die Wartung und die Reinigung des Pools wurde jeden zweiten Tag durch den Besitzer Paolo vorgenommen. Ansonsten ist man wirklich für sich. Den Nachbar bemerkt man gar nicht, da er meistens abwesend ist. Die Lage der Liegenschaft befindet sich etwas abseits der Straße, welche nach Massa und Cozzile führt. Also keine Lärmbelästigung durch Straßenverkehr etc. Am Abend jeweils eine wunderbare Geräuschkulisse von zirpenden Grillen. Für uns war es eine Oase der Erholung und jederzeit einen nochmaligen Urlaub wert. Leider ist der auf den Bildern zu erkennende Pizzaofen nicht mehr in Betrieb. Preis/Leistung für uns absolut in Ordnung.